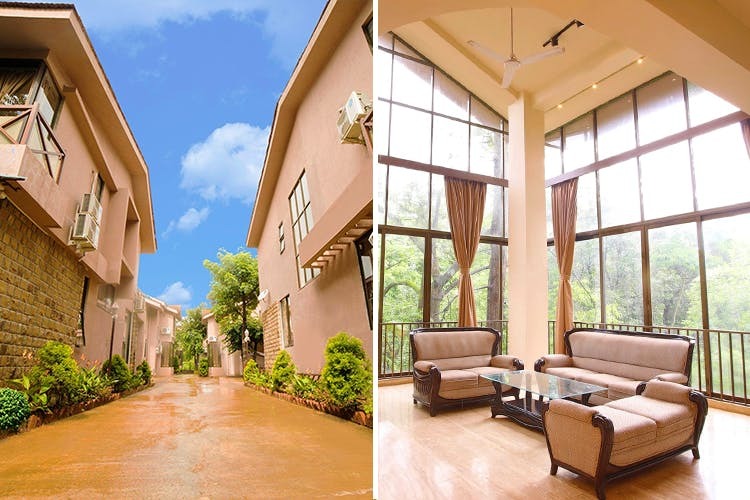 Seven Sands Ville is a 6-villa vacation property, located in Lonavala. Though they’re fairly new, we think that this property would be ideal for weekend getaways with your squad, or even family holidays with kids. Seven Sands Ville is located just off Old Khandala Road in Lonavala, and will take you around one-and-a-half hours (68km) to get here by road. It’s close to Lonavala market, in case you should need to make a supply run. The property has five 3-BHK villas and one 4-BHK villa that provides a total of 19 rooms for accommodation. The villas are all equipped with a large living and dining areas. The 4-BHK villa is the largest of them all and features the biggest rooms with the best views, as well as an al fresco dining area, a jacuzzi in two (of the four) bathrooms, and separate areas for lounging and dining. Seven Sands Ville is surrounded by lush greenery and panoramic views – which are especially breathtaking in the monsoon season. Meals are prepared and served by their in-house Chef, which you can opt-in for an extra charge. They serve multi-cuisine food and both veg and non-veg options, so we recommend you let them know your preference beforehand. Recreational facilities here include an outdoor swimming pool, board games, a children’s play area, and a gym (which is currently under renovation). An additional BBQ or bonfire can also be set up on request (at extra charge). If you’re looking for a relaxing getaway outside the city, without the throngs of tourists – we think Seven Seas Ville would be ideal for you! During the week (Mon-Thu), Seven Sands Ville rents out rooms on a 1BHK (for maximum 4 people) or 2BHK (for maximum 6-8 people) basis, but on weekends you have to book an entire villa if you plan to stay here. They’re currently offering a 20% discount on an villa tariffs for this month only, and we suggest you take them up on that offer!